An NBC Bay Area investigation reveals Irvine Auto Towing Inc, which also operates under the names “Stride,” “Pride” and “Modestow” should not have been on the road when it caused an accident that killed Lilianna Preciado, a mother of a two year old. Friends and family say they will remember Lilianna Preciado for her strength and her warmth. The San Francisco public utility worker was killed June 13 when she was hit by a Buick that rolled off the back of a tow truck owned by Irvine Auto Towing. The car rolled into a ditch where Preciado was working alongside two other city employees who managed to get out of the car’s path. As police investigators work to determine the cause of the accident, the NBC Bay Area Investigative Unit uncovered new records showing that the tow truck company responsible for the accident never should have been on the road that day. Lilianna Preciado was 34-years-old when she passed away, leaving behind a 2-year-old daughter. California Highway Patrol records reveal that Irvine Auto Towing’s motor carrier permit (CA# 422264) was suspended on April 20th, nearly two months before Preciado’s fatal accident. State regulators suspended the company’s permit after issuing 45 workplace and safety citations since 2012. This year alone, CHP cited Irvine Auto Towing for violations that include driving unregistered trucks, towing cars without safety restraints, and hiring drivers who did not have a valid driver's license. Bob Berry with Berry Brothers Towing in Oakland told NBC Bay Area that Irvine Auto Towing has a reputation in the industry for cutting corners. Bob Berry says he and other business owners have repeatedly warned CHP that Irvine Auto Towing is doing business without a valid motor carrier permit. Berry says he and other companies have called CHP several times throughout the years to complain about what he calls illegal business practices which allow them to operate cheaply, and dangerously. While Irvine Auto Towing has a long list of violations, all of those penalties occurred in Southern California. Here in the Bay Area, the company has managed to avoid scrutiny from law enforcement, operating under the names Stride, Pride, and Modestow. CHP Officer Mark Fisher works in the commercial enforcement unit and helps the agency regulate roughly 6.7 million commercial vehicles registered to operate on California highways. Officer Fisher told NBC Bay Area that his officers were unaware the company was operating out of Oakland with a suspended permit. “It's a sad incident that happened. It should never have happened,” Fisher said. NBC Bay Area asked Officer Fisher what agency is responsible for shutting down illegal operators. “Our motor carrier unit would go in and do an inspection on them. And they are the ones that would let them know that they should cease operations until they're up to satisfactory,” Fisher explained. However, that process did not occur following Preciado’s death. After NBC Bay Area inquired about the Irvine Auto tow yard in Oakland – CHP officers inspected the yard Monday, and issued an unsatisfactory rating. The company has 120 days to fix problems or it can be shut down. CHP has not issued any citations for the company, which was observed still towing cars Monday afternoon. 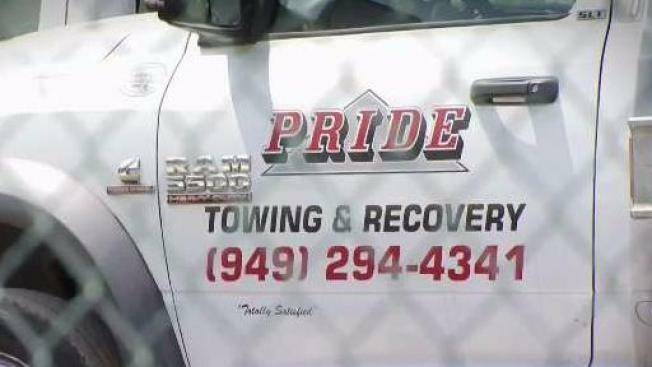 After several attempts to reach management, NBC Bay Area visited Irvine Auto Towing’s truck yard in Oakland to ask about the company’s safety record. CHP Records show Irvine Auto Towing's motor carrier permit was suspended on April 20th due to a lack of worker's compensation insurance. A driver confirmed that the company is still open for business and claimed he was unaware they are operating on a suspended permit. “I know nothing about that,” the driver said.